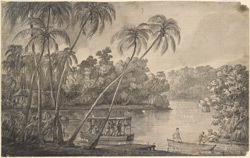 Pen and ink drawing of a river scene between point de Galle and Colombo in Sri Lanka, by Henry Salt (1780-1827), dated 20th December 1803. This drawing is inscribed on the back in pencil: 'Ceylon No. 39. ', and was the original drawing for Plate 8, 'The manner of passing a River between Point de Galle and Columbo', of Viscount Valentia's 'Voyages and Travels to India, Ceylon, the Red Sea, and Egypt...'. Viscount Valentia (George Annesley) wrote, "December 20.-...We arrived at the river before sunset, where a boat was ready to take over the palanquins. It was formed of three of their canoes fastened together, with a platform over them. Mr North had given orders for every attention to be paid to me, and I was consequently honoured with an awning of white cloth, and a chair covered with the same; a mark of distinction reserved for his excellency, and the King of Candy. The posts which sustained the awning, and the railing that went round the boat, were fancifully ornamented with the young leaves of the cocoa-nut, split into pieces, which had altogether a pretty effect. The river was clear, and the bank was covered with jungle to the water's edge. We here took leave of our very kind friends, and proceeded in our palanquins to Hamblamgodee, where we arrived about eight o'clock. The country the whole way was undulated, and occasionally broken by the most picturesque rocks; the vegetation as rich as ever, and the sea constantly close on our left hand. When it was dark, they made torches of the dead branches, or rather leaves, of the cocoa-nut: these burnt with rapidity and brilliancy, and had a beautiful effect, when reflected by the closely interwoven roof of lofty cocoa-nut trees, under which we were travelling."